Eric Sheptock never thought anyone cared about his take on biodiversity. After all, he wasn’t a scientist – he was a homelessness advocate living in a shelter himself. But when he was approached to take part in the World Wide Views on Biodiversity in 2012, Sheptock was excited to share his opinions and feel like an important part of the process. It’s that kind of diverse citizen input that organizers are seeking for the next WWViews event, this time on climate change and energy. It will be a one-day event that rolls out in time zones around the world on June 6, with more than 5,000 citizens and 50 countries participating. It begins at dawn in the Pacific Islands and heads west until ending at dusk at ASU’s Consortium for Science, Policy, and Outcomes. The views will be incorporated into the United Nations Framework Convention on Climate Change in Paris in December. Finding a truly representative group of citizens to participate is a challenge. In Arizona, for example, the 100-person group will need to include 14 people who don’t have a high school diploma to reflect the educational demographics identified by the 2010 U.S. Census. When the goal is to get input from a truly representative citizen group, those opinions count as much as anyone else’s. “Even if someone hasn’t finished high school, he or she is still a citizen of this particular geography. They have their views, and they may be different than those embraced by the educated community, but that doesn’t mean those views should be neglected,” said Netra Chhetri, who has long supported involving all citizens in the planning and development of policies that they will ultimately have to live with. Chhetri, associate professor with the Consortium for Science, Policy and Outcomes and senior sustainability scientist with the Julie Ann Wrigley Global Institute of Sustainability, is a WWViews project director. “We want to honor the multiple views about climate and energy because the policy or outcome of this UN framework should be useful for everybody,” Chhetri said. Perhaps just as valuable as providing genuine citizen input to United Nations proceedings, however, is the impact of the deliberation experience on the individual participants, young and old. “They will sit with five fellow citizens with different backgrounds and ethnicities for eight hours to deliberate and listen to others. Think of the possible empowerment that might happen while listening to others and having others listen to you,” Chhetri said. After the 2012 WWViews on Biodiversity, for example, one 82-year-old woman came up and hugged Chhetri. She was grateful that the university and the UN still cared about her experience and insight. Another woman who participated in the 2009 WWViews on Global Warming couldn’t read or write. She was so honored when she received the information booklet in the mail from a university – a place where she had never before set foot – that she asked her daughter to take the information to her middle school to discuss it with her teacher and class and get recommendations for what to say at the event. Mahmud Farooque, associate director of the consortium’s Washington, D.C., office and another WWViews project manager, agreed that the long-term benefits of the experience are immeasurable. Standard approaches to outreach, however, such as listservs, posters and pamphlets, frequently fail when attempting to engage lower-income, illiterate or non-English-speaking citizens. Chhetri and his colleagues had to figure out different ways to reach those people and persuade them to participate, including sending fliers in handwritten envelopes to low-income neighborhoods, advertising on Telemundo and the Craigslist job section, and speaking to people at homeless shelters, public markets and international grocery stores. Talking with people, they’re able to emphasize that the event is for non-experts, who don’t need any specific science or current-events knowledge, to allay any potential fears of being embarrassed. In addition to the pamphlet mailed out before the event, which is available in multiple languages, participants watch short videos to bring them up to speed on whatever issues they will deliberate. A trained facilitator makes sure that all participants get the same amount of time to talk before each person votes individually for what he or she believes is the best answer to various questions. The results are published immediately on a Web platform. “Participants can see how their answers compare with those of citizens around the world, which is a particularly powerful experience for citizens in non-democratic countries,” Farooque said. 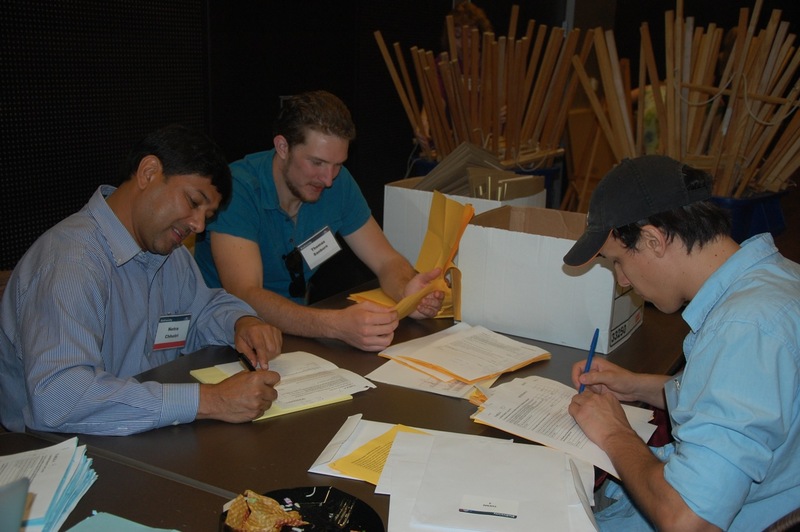 Participants with a variety of incomes, education levels and ethnic backgrounds, from both rural and urban areas, are still needed for the upcoming event in Tempe on June 6. The project managers are hoping that the wider ASU community might be able to provide connections to those who might be a good fit. The daylong event includes lunch and a $100 stipend, funded by ASU’s School of Sustainability. Additional stipends are also available for transportation to help meet the demographic requirements. For more information or to apply, please visit the CSPO WWViews webpage at cspo.org/research/wwviews-climate-and-energy.